These pontoon boat seats make up our Premium CFG66 pontoon furniture set. We have a 96 Sundancer 24 foot. We are also planning on a new marine grade tounge deck plus new carpet adding the riser kits. The seats are starting to deriorate ad are looking kinda shabby. It also has a rear sun deck. What deminisions would be needed to replace seating with plastic or fiberglass seating. Would pictures help? It seems like you are on the right track with your rebuild! 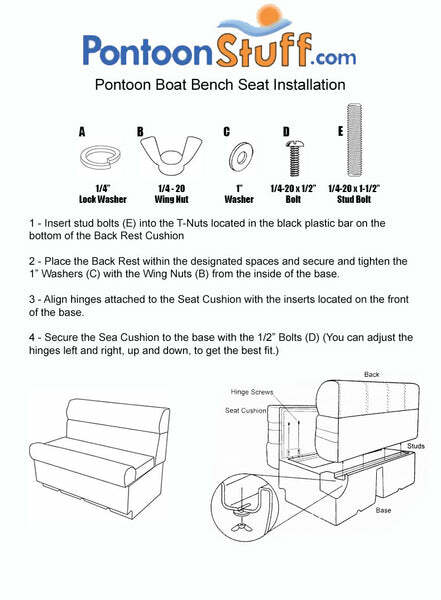 For measuring your seats I have included a link that will give you s deatiled explanation on how to measure for your new pontoon seats. In terms of the sundeck that is not something we currently sell but it is usaually best to have it recovered by a local upholstry shop. We sell the matching vinyl by the yard they can use to match your new seats. Also please feel free to e-mail us or call and one of our represtives can help you as well. We have a 2001 22' Suntracker Regency. Are your seat replacements compatible? Also do sell just the replacement cushions? Our seats will be compatible for your 22' pontoon boat. Unfortunately we do not sell just the seat cushions.